"What is the most common probable cause for machine malfunction?" Machines fail for a variety of reasons. Likewise, not all failures are the same. The term "machinery failure" or "malfunction" usually implies that the machine has stopped functioning the way in which it was intended or designed. This is referred to as “loss of usefulness” of the machine or component. For instance, if a pump is installed to pump 100 gallons of oil per minute but over time can no longer keep up and now only pumps 75 gallons per minute, this is a loss of usefulness of the asset. 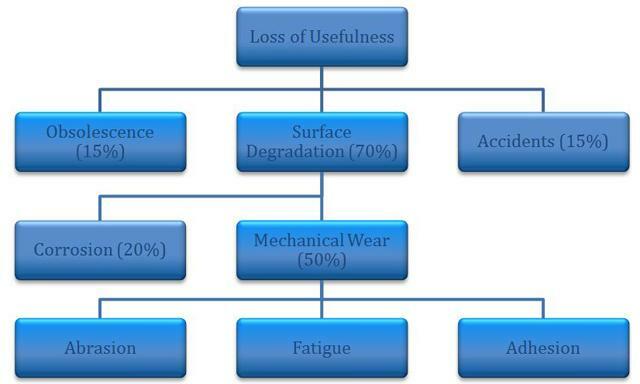 This loss of usefulness is broken down into three main categories: obsolescence, surface degradation and accidents. Of these three, surface degradation of machine parts results in the machine’s loss of usefulness in the vast majority of cases. Surface degradation is comprised mainly of corrosion and mechanical wear. 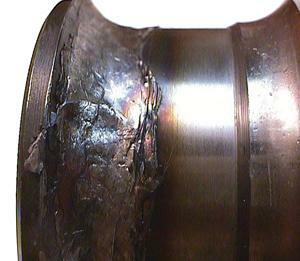 Corrosion of machine parts is quite common, especially for those with water-contamination issues. Water not only rusts iron surfaces, but it can also increase the oil’s oxidation rate, leading to an acidic environment within the component. Acids can also be formed as byproducts of reactions between certain additives in the oil and water. Product contamination through seals can create caustic environments and corrosive wear as well. Something as simple as having an aggressive extreme-pressure additive in contact with a yellow metal (copper, bronze, brass, etc.) can produce corrosive damage. Mechanical wear occurs when machine surfaces mechanically wearing against each other. Abrasive wear is a method in which particle contamination causes the majority of the wear. Particles such as dirt or wear debris can lead to three-body abrasion or surface fatigue, which results in the surfaces becoming pitted and scored. Adhesive wear involves two surfaces coming in direct contact with each other, transferring material from one face to the other. 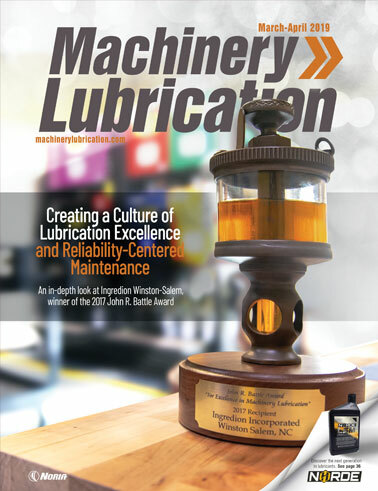 This appears in areas where the lubricant can no longer support the load or in areas of lubricant starvation. Metal fatigue is similar to what happens when you try to cut wire without any tools. As you work the wire back and forth, the metal begins to work harder and fatigue. After enough cycles of this type of stress, the metal finally becomes brittle and snaps. The same process occurs in machines. For example, a particle can cause a stress riser on the inner race of a rolling-element bearing. Over time and with constant flexing, the metal begins to fatigue. This propagates into a spall of the material. So as machines can lose their functionality in a variety of methods, it is the surface degradation of the machine parts that causes the majority of these problems. 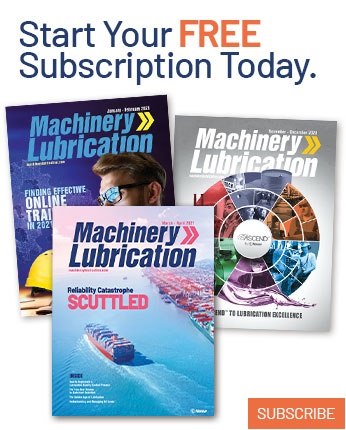 By keeping your machines properly sealed to restrict the ingress of particles and making sure the lubricants you use meet the operating demands of the components, you can extend machine life and see fewer total failures.